5V. This pin outputs a regulated 5V from the regulator on the board. 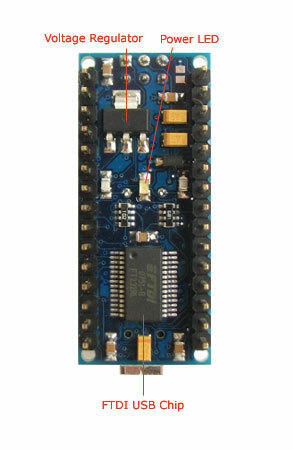 The board can be supplied with power either from the screw terminal (2.5V – 12V) or the VIN pin of the board (2.5V-12V). Supplying voltage via the 5V or 3.3V pins bypasses the regulator, and can damage your board. We don’t advise it. The Bluegiga WT11 module on the Arduino BT provides Bluetooth communication with computers, phones, and other Bluetooth devices. The WT11 communicates with the ATmega328 via serial (shared with the RX and TX pins on the board). It comes configured for 115200 baud communication. The module should be configurable and detectable by your operating system’s bluetooth drivers, which should then provide a virtual com port for use by other applications. 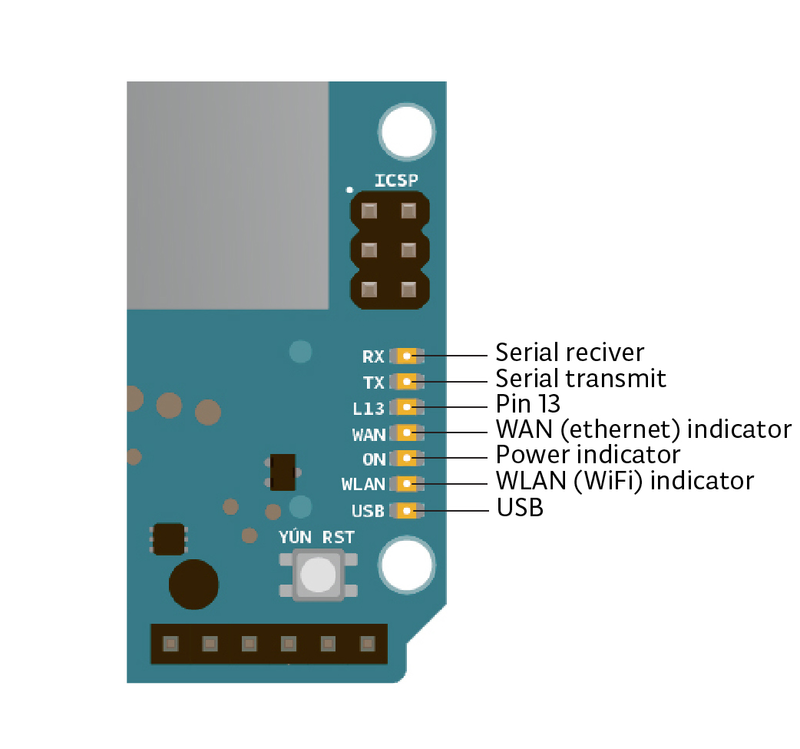 The Arduino software includes a serial monitor which allows simple textual data to be sent to and from the Arduino board over this bluetooth connection. The board can also be reprogrammed using this same wireless connection. 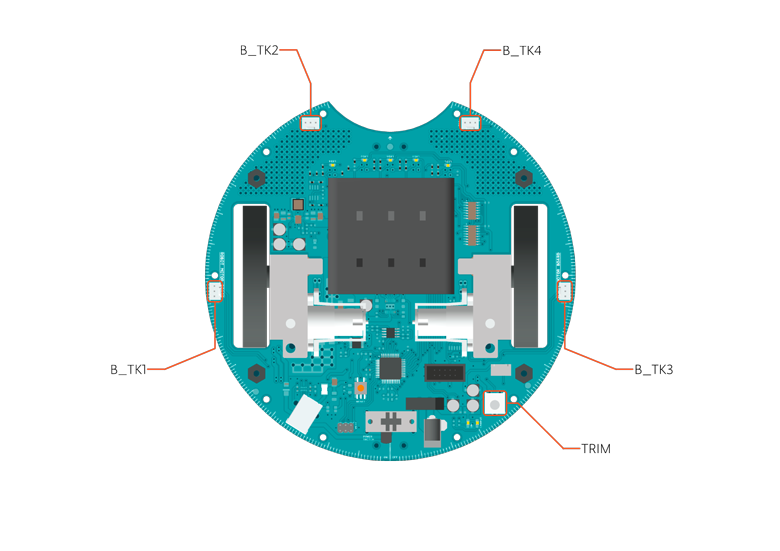 The WT11 is specially configured for use in the Arduino BT. Its name is set to ARDUINOBT and passcode to 12345. For details, see the complete initialization sketch. The Arduino BT has a number of other facilities for communicating. The ATmega328’s UART TTL (5V) serial communication is available on digital pins 0 (RX) and 1 (TX) as well as being connected to the WT11 module. A SoftwareSerial library allows for serial communication on any of the BT’s digital pins. The ATmega328 also supports I2C (TWI) and SPI communication. The Arduino software includes a Wire library to simplify use of the I2C bus; see the documentation on the Wiring website for details. To use the SPI communication, please see theATmega328 datasheet. The maximum length and width of the BT are approximately 3.2 and 2.1 inches respectively. Three screw holes allow the board to be attached to a surface or case. Note that the distance between digital pins 7 and 8 is 160 mil (0.16″), not an even multiple of the 100 mil spacing of the other pins. The Arduino Esplora is a microcontroller board derived from the Arduino Leonardo. 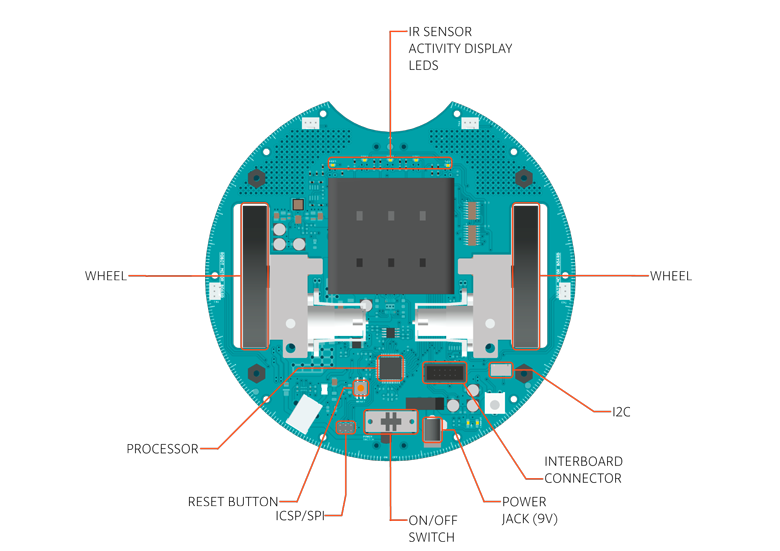 The Esplora differs from all preceding Arduino boards in that it provides a number of built-in, ready-to-use setof onboard sensors for interaction. 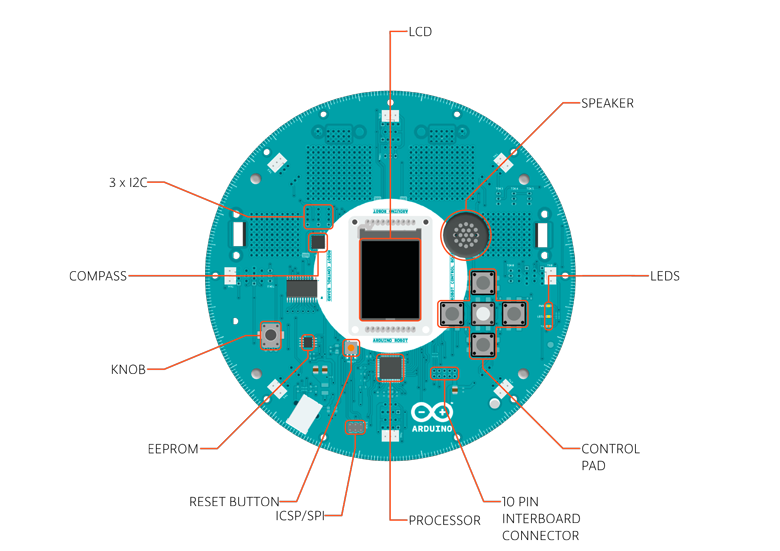 It’s designed for people who want to get up and running with Arduino without having to learn about the electronics first. For a step-by-step introduction to the Esplora, check out the Getting Started with Esplora guide. The Esplora can be programmed with the Arduino software (download). 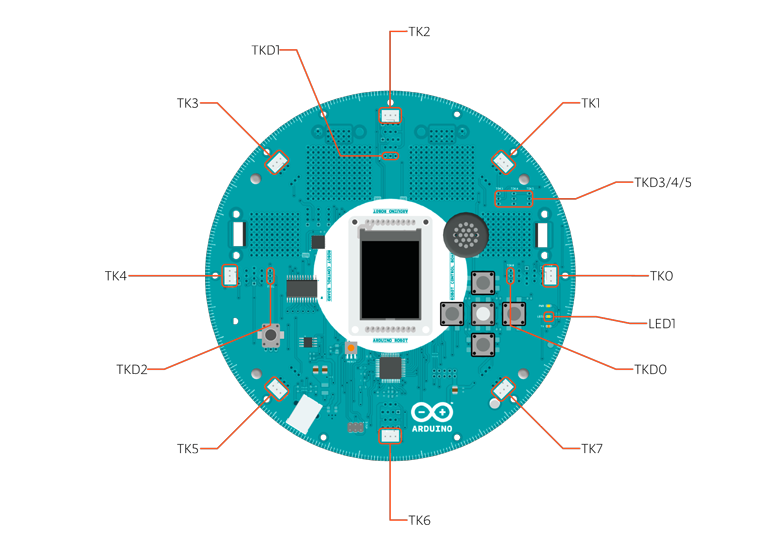 Select «Arduino Esplora» from the Tools > Board menu. For details, see the getting started page. Rather than requiring a physical press of the reset button before an upload, the Esplora is designed in a way that allows it to be reset by software running on a connected computer. The reset is triggered when the Esplora’s virtual (CDC) serial / COM port is opened at 1200 baud and then closed. When this happens, the processor will reset, breaking the USB connection to the computer (meaning that the virtual serial / COM port will disappear). After the processor resets, the bootloader starts, remaining active for about 8 seconds. The bootloader can also be initiated by pressing the reset button on the Esplora. Note that when the board first powers up, it will jump straight to the user sketch, if present, rather than initiating the bootloader. Because of the way the Esplora handles reset it’s best to let the Arduino software try to initiate the reset before uploading, especially if you are in the habit of pressing the reset button before uploading on other boards. If the software can’t reset the board you can always start the bootloader by pressing the reset button on the board. The Esplora has a resettable polyfuse that protects your computer’s USB ports from shorts and overcurrent. Although most computers provide their own internal protection, the fuse provides an extra layer of protection. If more than 500 mA is applied to the USB port, the fuse will automatically break the connection until the short or overload is removed. «Uno» means one in Italian and is named to mark the upcoming release of Arduino 1.0. The Uno and version 1.0 will be the reference versions of Arduino, moving forward. The Uno is the latest in a series of USB Arduino boards, and the reference model for the Arduino platform; for a comparison with previous versions, see the index of Arduino boards?. «Uno» means «One» in Italian and is named to mark the upcoming release of Arduino 1.0. The Uno and version 1.0 will be the reference versions of Arduino, moving forward. 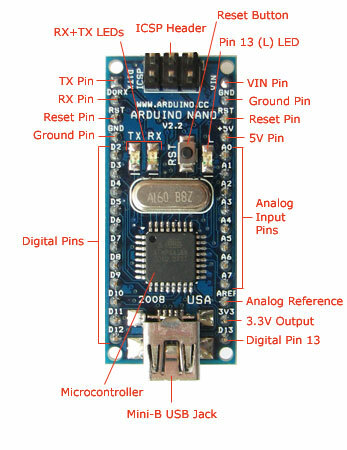 The Uno is the latest in a series of USB Arduino boards, and the reference model for the Arduino platform; for a comparison with previous versions, see theindex of Arduino boards. Como siempre con Arduino, todos los elementos de la plataforma – hardware, software y documentación – es de libre acceso y de código abierto. Esto significa que usted puede aprender exactamente cómo se hace y utilizar su diseño como punto de partida para sus propios robots. El Arduino Robot es el resultado del esfuerzo colectivo de un equipo internacional que mira cómo la ciencia puede ser divertida de aprender. Arduino está ahora sobre ruedas y viene paseo con nosotros! The Arduino Robot can be powered via the USB connection or with 4 AA batteries. The power source is selected automatically. The battery holder holds 4 rechargeable NiMh AA batteries. NB : Do not use non-rechargeable batteries with the robot For safety purposes, the motors are disabled when the robot is powered from the USB connection. The robot has an on-board battery charger that requires 9V external power coming from an AC-to-DC adapter (wall-wart). The adapter can be connected by plugging a 2.1mm center-positive plug into the Motor Board’s power jack. The charger will not operate if powered by USB. The Control Board is powered by the power supply on the Motor Board. The ATmega32u4 has 32 KB (with 4 KB used for the bootloader). It also has 2.5 KB of SRAM and 1 KB of EEPROM (which can be read and written with the EEPROM library). The Control Board has an extra 512 Kbit EEPROM that can be accessed via I2C. There is an external SD card reader attached to the GTFT screen that can be accessed by the Control Board’s processor for additional storage. Control Board TK0 to TK7: these pins are multiplexed to a single analog pin on theControl Board’s microprocessor. They can be used as analog inputs for sensors like distance sensors, analog ultrasound sensors, or mechanical switches to detect collisions. Control Board TKD0 to TKD5: these are digital I/O pins directly connected to the processor, addressed usingRobot.digitalRead() and Robot.digitalWrite) functions. Pins TKD0 to TKD3 can also be used as analog inputs withRobot.analogRead() Note: if you have one of the first generation robots, you will see that the TKD* pins are named TDK* on the Robot’s silkscreen. TKD* is the proper name for them and is how we address them on the software. Serial Communication: The boards communicate with each other using the processors’ serial port. A 10-pin connector connects both boards carries the serial communication, as well as power and additional information like the battery’s current charge. The Robot can be programmed with the Arduino software (download). 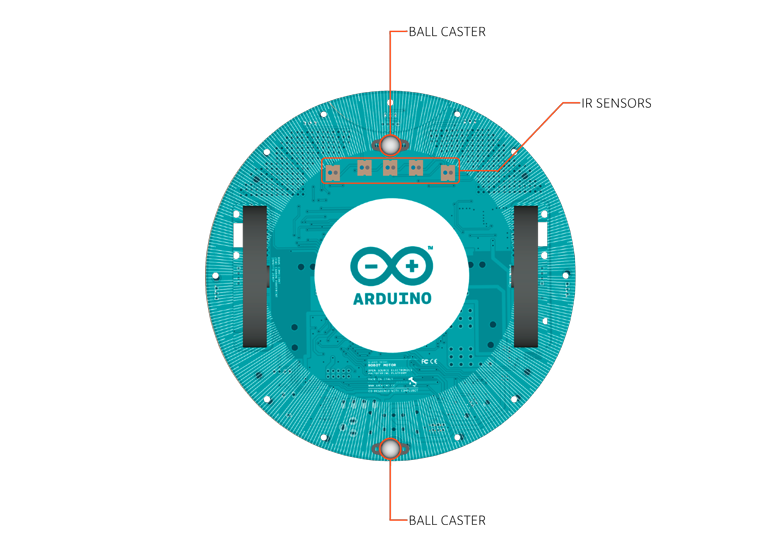 Select «Arduino Robot Control Board» or «Arduino Robot Motor Board» from the Tools > Board menu. For details, see the getting started page and tutorials. The ATmega32U4 processors on the Arduino Robot come preburned with a bootloader that allows you to upload new code to it without the use of an external hardware programmer. It communicates using the AVR109 protocol. You can bypass the bootloader and program the microcontroller through the ICSP (In-Circuit Serial Programming) header; see these instructions for details. Rather than requiring a physical press of the reset button before an upload, the Robot is designed in a way that allows it to be reset by software running on a connected computer. The reset is triggered when the Robot’s virtual (CDC) serial / COM port is opened at 1200 baud and then closed. When this happens, the processor will reset, breaking the USB connection to the computer (meaning that the virtual serial / COM port will disappear). After the processor resets, the bootloader starts, remaining active for about 8 seconds. The bootloader can also be initiated by double-pressing the reset button on the Robot. Note that when the board first powers up, it will jump straight to the user sketch, if present, rather than initiating the bootloader. Because of the way the Robot handles reset it’s best to let the Arduino software try to initiate the reset before uploading, especially if you are in the habit of pressing the reset button before uploading on other boards. If the software can’t reset the board you can always start the bootloader by double-pressing the reset button on the board. A single press on the reset will restart the user sketch, a double press will initiate the bootloader. Both of the Robot boards have a resettable polyfuse that protects your computer’s USB ports from shorts and overcurrent. Although most computers provide their own internal protection, the fuse provides an extra layer of protection. If more than 500 mA is applied to the USB port, the fuse will automatically break the connection until the short or overload is removed. See also: getting started with the Arduino Robot and the Robot’s library pages. The memory on the AR9331 is not embedded inside the processor. The RAM and the storage memory are externally connected. The Yún has 64 MB of DDR2 RAM and 16 MB of flash memory. 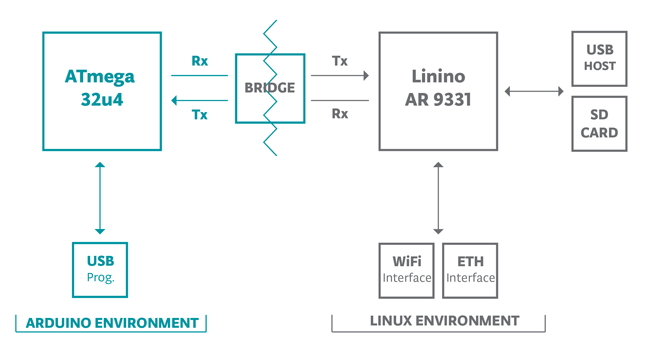 The flash memory is preloaded in factory with a Linux distribution based on OpenWRT called Linino. You can change the content of the factory image, such as when you install a program or when you change a configuration file. You can return to the factory configuration by pressing the «WLAN RST» button for 30 seconds. SPI: on the ICSP header. These pins support SPI communication using the SPI library. Note that the SPI pins are not connected to any of the digital I/O pins as they are on the Uno, They are only available on the ICSP connector. This means that if you have a shield that uses SPI, but does NOT have a 6-pin ICSP connector that connects to the Yún’s 6-pin ICSP header, the shield will not work. Analog Inputs: A0 – A5, A6 – A11 (on digital pins 4, 6, 8, 9, 10, and 12). The Yún has 12 analog inputs, labeled A0 through A11, all of which can also be used as digital i/o. Pins A0-A5 appear in the same locations as on the Uno; inputs A6-A11 are on digital i/o pins 4, 6, 8, 9, 10, and 12 respectively. Each analog input provide 10 bits of resolution (i.e. 1024 different values). By default the analog inputs measure from ground to 5 volts, though is it possible to change the upper end of their range using the AREF pin and the analogReference() function. WLAN RST. This button has a double feature. Primarly serves to restore the WiFi to the factory configuration. 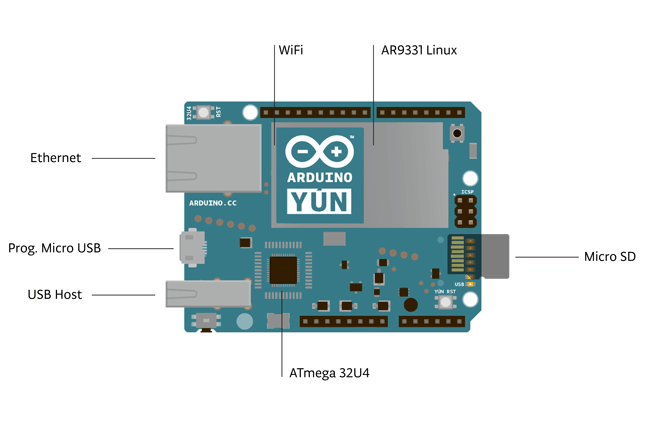 The factory configuration consist to put the WiFi of the Yún in access point mode (AP) and assign to it the default IP address that is 192.168.240.1, in this condition you can connect with your computer to the a WiFi network that appear with the SSID name «Arduino Yun-XXXXXXXXXXXX», where the twelve ‘X’ are the MAC address of your Yún. Once connected you can reach the web panel of the Yún with a browser at the 192.168.240.1 or «http://arduino.local» address. Note that restoring the WiFi configuration will cause the reboot of the linux environment. To restore your WiFi configuration you have to press and hold the WLAN RST button for 5 seconds. When you press the button the WLAN blue LED will start to blink and will keep still blinking when you release the button after 5 seconds indicating that the WiFi restore procedure has been recorded. The second function of the WLAN RST button is torestore the linux image to the default factory image. To restore the linux environment you must press the button for 30 seconds. Note that restoring the factory image make you lose all the files saved and softwares installed on the on-board flash memory connected to the AR9331. A SoftwareSerial library allows for serial communication on any of the Yún’s digital pins except for pins 0 and 1. The Yún can be programmed with the Arduino software (download). Select «Arduino Yún from the Tools > Board menu (according to the microcontroller on your board). For details, see the reference and tutorials. Rather than requiring a physical press of the reset button before an upload, the Yún is designed in a way that allows it to be reset by software running on a connected computer. The reset is triggered when the Yún’s virtual (CDC) serial / COM port is opened at 1200 baud and then closed. When this happens, the processor will reset, breaking the USB connection to the computer (meaning that the virtual serial / COM port will disappear). After the processor resets, the bootloader starts, remaining active for about 8 seconds. The bootloader can also be initiated by pressing the reset button on the Yún. Note that when the board first powers up, it will jump straight to the user sketch, if present, rather than initiating the bootloader. 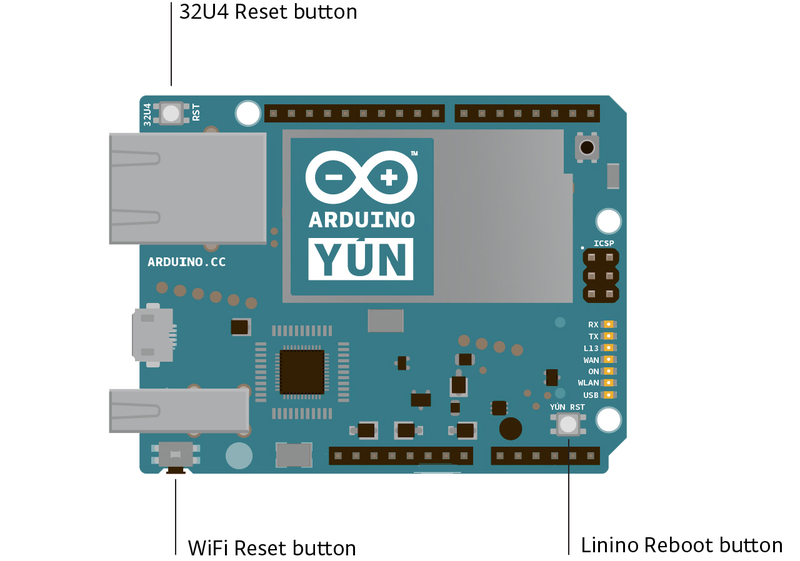 Because of the way the Yún handles reset it’s best to let the Arduino software try to initiate the reset before uploading, especially if you are in the habit of pressing the reset button before uploading on other boards. If the software can’t reset the board you can always start the bootloader by pressing the reset button on the board. The Yún has a resettable polyfuse that protects your computer’s USB ports from shorts and overcurrent. Although most computers provide their own internal protection, the fuse provides an extra layer of protection. If more than 500 mA is applied to the USB port, the fuse will automatically break the connection until the short or overload is removed. The maximum length and width of the Yún PCB are 2.7 and 2.1 inches respectively, with the USB connector extending beyond the former dimension. Four screw holes allow the board to be attached to a surface or case. Note that the distance between digital pins 7 and 8 is 160 mil (0.16″), not an even multiple of the 100 mil spacing of the other pins.